William A. Galston and Elaine C. Kamarck [“Against Short-Termism,” Issue #38] have described the economic situation very well but have not explained how it got this way. A more ecological/systemic approach is required if we are to come up with countermeasures to Wall Street’s short-termism. The problem is much deeper than the authors suggest. In my field of management, it lies in the reform of business schools in the late 1950s and the attempt to make management a “science.” This change encouraged a manipulative engineering approach to wicked problems. These often result in short-term gains followed by unintended long-run consequences. This is what we are seeing now. The question is, how do “we” change anything, let alone our worldviews or mindsets? Galston and Kamarck’s “Against Short-Termism” [Issue #38] really zooms in on both the causes and solutions of our dysfunctional economy. We need more focus on long-term investment, sustainability, growth, and corporate citizenship—giving back to the community. Instead of quarterly numbers, investors should focus on five- or ten-year cycles. This would restore faith in capitalism, build a truly strong economy, and ensure future prosperity. The First Amendment’s no-established-religion clause stemmed from the fear of various sects that one sect would become the state religion, disadvantaging the others. [“Laissez Prayer,” Issue #38] Thus, support for the clause came from a perceived self-interest on the part of minority sects more than anything else. What we now have is an unofficial state religion—call it statist Christianity—to which even nonbelievers belong. When I was growing up in 1950s Minnesota, our local priest prohibited parish kids from playing basketball in the Lutheran DeMolay league. Catholics were not Christians—they were Catholics. Today, everyone is a Christian, in name at least, and they pray together with the blessing as it were of the government, to a variety of gods. 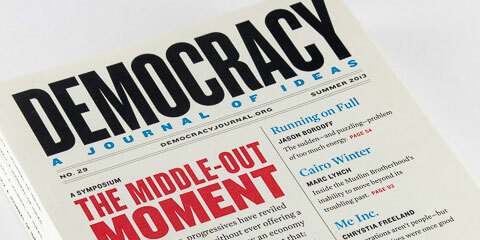 Democracy Readers who would like to submit a letter to the editor can do so by emailing dajoi@democracyjournal.org.